The discovery of Gliese 581g (also Zamina, its preliminary nickname) has led to a lot of discussion on just how far 20 light years is. You might notice the number 180,000 in a few articles, which is the number of years it would take to reach there at the current velocity of the fastest probe we have at present. This number is not just useful for debunking claims that the planet is "right next door" as some have said, however. Let's take a look at some simple facts. Fact: a mission to any star would be extremely expensive, and at most would result in information on one star system only. So what does this mean? Very simple: we need to do three things. 1) Spend a lot more money on telescopes, 2) begin to explore our own Solar System, 3) begin working on more advanced forms of propulsion in preparation for later. 1) is very easy to explain. 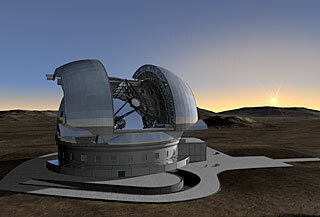 Take the European Extremely Large Telescope. Due for completion in 2018, it will end up being 100 times more powerful than the Hubble Space Telescope, in spite of being located on the ground. Total cost: about $1.3 billion, which is just about one third what the Cassini mission cost, or about twice that of your average unmanned probe to Mars. Developing newer and better telescopes is the quickest way at the moment to learn more about these earth-like planets that we are now beginning to discover. With a telescope the cost is low, there is nothing to launch, no waiting time before arrival. All you have to do is build it, and look up. So we need to heavily invest in this, as this is the best way that we are going to learn more about these planets in the shortest time possible. 2) even though it's a bit sad that these new planets are all so far away, keep in mind that our own solar system is still full of possibilities. We just found out last year that the Moon creates its own H2O, life could be present in the cloudtops of Venus, Mars, Europa and Enceladus, and we haven't even been more than 400,000 km from our own planet yet. There's lots to do in our own corner of the galaxy for the time being. 3) new forms of propulsion will need to be developed as yes, eventually we will want to start sending people to explore these planets. Thanks to 1) we will know a fair bit about them even before we arrive, and thanks to 2) we will be more confident in doing so. If we are lucky then we will find something interesting around a nearby brown dwarf (a planet in the habitable zone of one of these, which could exist outside the Roche limit according to this paper on pdf) and that will become our first destination. At a (relatively) close distance of a light year or two, the travel time for radio signals to and from there will at least be bearable. We may instead send a probe with advanced AI to check out the system without needing to be run by humans, but if the planet(s) orbiting the brown dwarf turn out to be really interesting we will be driven by an urge to see it ourselves. So in short, we need bigger and better telescopes, and the more of them we build the more we will know all about these new planets right now. Not in the next decade or two, now.